Location Information: Gezaincourt is a village situated 2 Kms to the south-west of the town of Doullens. 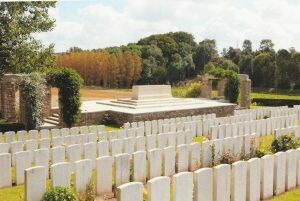 Bagneux British Cemetery lies to the south of the village. There is a Commonwealth War Graves Commission signpost in Gezaincourt village opposite the “Chateau” entrance. 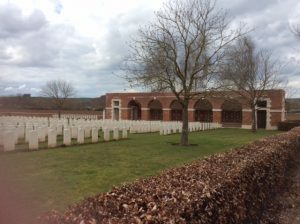 Historical Information: At the end of March, the 3rd, 29th and 56th Casualty Clearing Stations moved to Gezaincourt, where they were joined for a short time in April by the 45th. They remained until September. 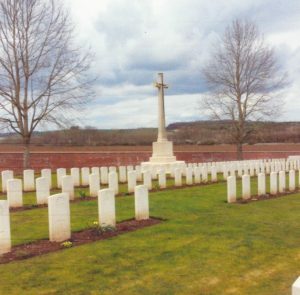 The cemetery was begun in April 1918, after the close of the German offensive in Picardy. 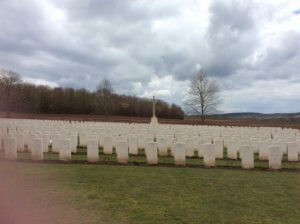 The 3rd Canadian Stationary Hospital, in the citadel at Doullens, also buried in this cemetery in May and June 1918, and the 2nd Canadian Division in April and May. 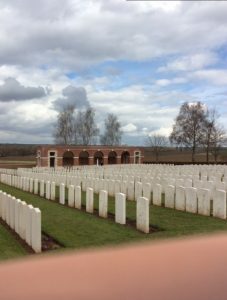 The graves in Plot III, Row A relate to a bombing raid over Doullens on 30 May 1918. There are 1,374 servicemen of the First World War buried or commemorated in the cemetery. Aug 1914 Formed at Guildford as part of the First New Army (K1) and then moved to Purfleet to join the 37th Brigade of the 12th Division then moved to Hythe. 1915 The Battle of Loos. 1916 The Battle of Albert, The Battle of Pozieres, The Battle of Le Transloy. 1917 The First Battle of the Scarpe, The Battle of Arleux, The Third Battle of the Scarpe, The Cambrai operations. 1918 The Battle of Bapaume, The First Battle of Arras 1918, The Battle of Amiens, The Battle of Albert, The Battle of Epehy, The Final Advance in Artois. 11.11.1918 Ended the war in Rumegies, East of Orchies, France. WW1 War diaries for Queen’s (Royal West Surrey Regiment) – 6th Battalion. 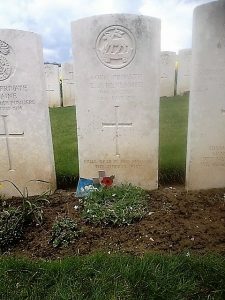 In the Line: 30th June 1918 The assembly for the operation in W.15 d “37” INFANTRY BRIGADE ORDER 204 commenced at 3:30 p.m. and was complete by 5:45 p.m., the whole movement being carried out without casualties. Touch was obtained with the Royal West Kents on the left, but was not gained with the Bedfords on our right. About 12:00 midnight the situation was obscure. at 07:30 Touch was obtained with the Bedfords by means of a small Bombing Raid. At 3:00 pom touch was lost with the Bedfords on our right. In the line 3rd July 1918 The day was quiet and spent in rest and cleaning up. OTHER RANKS Killed 28, Missing 8, Wounded 190.